FOR the second time in five seasons, North Wirral Velo-Kodak are the RTTC national 100-kilometre team time trial champions. But Chris Boardman's old club regained the title only after their sister squad, Adidas-SciCon, had been delayed by a puncture which almost certainly cost them victory. Sean Yates and his Team Clean colleagues had to settle for the bronze medals. Olympic team pursuiter Chris Newton turned in a powerhouse performance to lead North Wirral team-mates Julian Ramsbottom, Matthew Bottrill and Brett Harwood around the Devon course in 2-11-55 for a margin of just 35 seconds over the Adidas quartet of Paul Manning, Andy Wilkinson, Glenn Holmes and Paul West, who had looked well on their way to victory until they lost up to three minutes when Manning punctured after just five miles. Adidas salvaged the silver medals by just 10 seconds from Yates and his team-mates Tim Stevens, Dave Redding and Anthony Stapleton. North Wirral Velo's winning time - the slowest since 1990 - reflected the toughness of the course at Tedburn St Mary, near Exeter, where long drags and two more severe climbs made it ideal for the all-round roadmen abilities of the North Wirral riders. Adidas were well off the pace in third place at half-distance in the Exeter Wheelers event following Manning's puncture, but turned in a storming second-half performance which almost swung the result in their favour. But while North Wirral finished with a complete team, Adidas lost Paul West along the way as they fought hard to make up the 1-39 deficit on the Newton-led foursome at 50 kilometres. Team Clean were also down to three at the finish - Yates, Stevens and Redding - Stapleton having been dropped during the first of two laps of the A30-based course. Understandably, Yates - with his years of team time trialling in the Tour de France - and Stevens carried the brunt of the work, with short-distance specialist Redding hanging on for grim death in the closing stages. Fourth place went to GS Strada - with Kevin Dawson, Wayne Randle and Martin Ford - but their 2-15-47 left them well out of the picture as they lost fourth man Duncan Moralee along the way. In fifth were the Hounslow and District Wheelers trio of Colin Roshier, Paul Holdsworth and Bob Garlinge, the latter a gold medallist in the event in 1973 and 1974. Fourth man Robin Jackson had to pull out when his tri-bars snapped with five miles to go, and the Hounslow squad ended up with 2-16-19. After a heavy downpour during the night, conditions were good on Sunday morning, with just a slight crosswind. Traffic on the Devon roads was light, even as the later starters were riding, and the only team that ran into trouble was Tavistock Wheelers, who were baulked by a lorry as they went into the last mile through the narrow stretch in Tedburn St Mary. The first of the fancied teams in action was Hounslow and District Wheelers, whose 1-07-15 for the first 50 kilometres gave them the early lead on the result board. The MCS RT `A' team of Nic Hutchings, Simon Ambrosini, Simon Saunders and Serge Scott were closest to them, with 1-9-15. The Army TTT squad, led by Keith Murray, reached halfway in 1-11-33. GS Strada moved into the frame as, led by former Optimum Performance RT gold medallists Dawson and Randle, they posted 1-07-24 with 50 kilometres in their legs. Manning and his Adidas-SciCon team were off at lam and got quickly into their rhythm, but disaster struck within five minutes when Manning punctured. It was around three minutes before he obtained a wheel and got on the road again, but the rest of the team waited for him, knowing they needed his powerful riding to get them into the medals. At 50 kilometres they were through in 1-07-02, good enough to put them into a temporary lead. It was the well-drilled North Wirral Velo who pushed them down to second with their 1-05-23. And less than 10 minutes later Yates and Team Clean moved into second with their 1-05-26. Everything was still to play for as the second leg began. First to finish were Hounslow and District Wheelers, looking tired as they breasted the final climb into Tedburn St Mary. Their 2-16-19 was good enough to keep them at the top of the result board for nearly half an hour until Dawson, Randle and Ford bettered their time by 32 seconds. Manning and colleagues had been 22 seconds faster than GS Strada at 50 kilometres. The second half saw them take an additional 2-56 out of the Stoke-based team, and they took the race lead, covering the second half in 1-05-28. Now it was down to North Wirral and Team Clean. The sound of Newton shouting at his team-mates heralded North Wirral's arrival on that last climb. Newton was looking back at Harwood, Bottrill and Ramsbottom and giving them vocal encouragement - of a somewhat colourful nature - with a shade over one mile remaining. A 1-06-32 second leg left them with that final winning 2-11-55. Team Clean had been just three seconds behind Newton and company at 50 kilometres. Could they reduce that on the second circuit? The answer was no. Yates, Stevens and a battered Redding had no answer to the North Wirral effort, taking 1-07-14 to complete the second 50 kilometres and falling back to third with 2-12-40. On this occasion it was a case of youth overcoming experience. Of the 28 teams entered, three did not start. With Matt Postle and Julian Winn both unfit, Cwmcarn Paragon `A' scratched, along with Border City Wheelers and VC St Raphael. Two teams failed to finish, both Sydenham Wheelers and the MCS `B' crashing out. 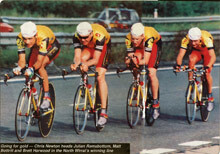 THERE was no disguising the delight of North Wirral Velo's team manager Pete Longbottom, who, four years earlier, had been in the same winning team as Chris Boardman, Paul Jennings and Simon Lillistone. "Chris [Newton] was the driving force," he explained, "He hammered the boys, but they pulled everything out to back him." Matthew Bottrill and Brett Harwood were, to say the least, impressed with Newton's riding. "It was just unbelievable," said Bottrill. "I've never had to ride so hard." Harwood added: "I'm going well at last - riding so many stage races this season has helped. I overdid training for the `25' championship, but I've had a bit of a rest and it paid off today." "He was head and shoulders above us," said Julian Ramsbottom of Newton. "He towed us for the last 20 miles. It was the first time I've had to use the small ring in a time trial - the course was so hilly." Newton himself was relaxed about his performance and certainly didn't look the worse for wear. "The course had a bit of everything for everyone," he said. "I'm feeling very fresh with the second half of the season coming up. That has been my intention, with the Tour de I'Avenir in mind. Adidas-SciCon team manager John Herety said: "It would have helped if each team was allowed a following car - the roads were certainly quiet enough to have allowed for it. It's a long way to come and then lose because of a puncture - perhaps the RTTC will think about it in the future. "Paul [Manning] punctured after six or seven miles and he had to wait three minutes before he was able to get a wheel. Then Paul West had a spoke break, leaving us with three riders to do the last 12 miles. "But, as you can see, we were still the only team to have a faster second half, so without our troubles we would have won. But that's how racing goes - a lot of luck comes into it." "I thought we were in with the chance of a medal," said Team Clean's Sean Yates. "But we were up against experienced roadmen, and I knew it would be an uphill battle. Tim [Stevens] was up to it, but it was difficult for Anthony [Stapleton] and Dave [Redding], who are more used to `10s' and '25s'. "Tim and I had to use our heads, not riding too hard and blowing the rest out. For the last quarter of the race it was just the two of us, with Dave hanging on - he really tried. "We were up against Manning and Newton - they are the future for British cycling - and Andy Wilkinson, so taking that into consideration we rode well to take a medal." Keith Murray led the Army TTT to ninth place, "It was like riding a mountain time trial today," he said. "It was one of the hardest courses I've ridden. I know I'm fit - I did a personal best of 19-53 this week to win the inter-services `10', and also won the inter-services `25' at Salisbury." To complete his week, the Army TTT also won the inter-services team time trial championship, incorporated into the RTTC event, ahead of the RAF CC and the Royal Navy and Royal Marines CRC. After watching their Hounslow and District Wheelers clubmates finish back in fifth place, Martyn Roach and Jeff Marshall - members of the winning team in 1973 and 1974 - had the answer to the problem. "We need some young blood in the club," they both agreed.